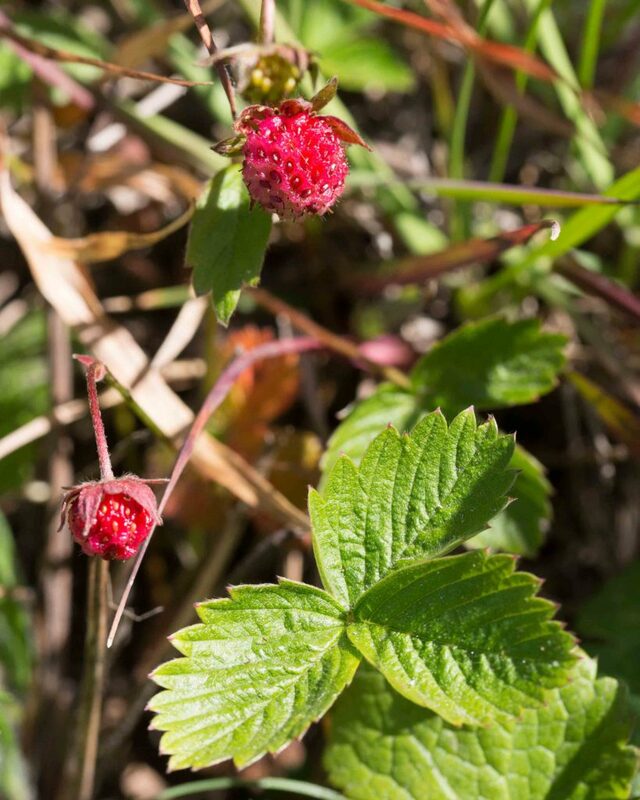 This plant needs little comment other than to say that the fruits make up in flavor for what they lack in size. 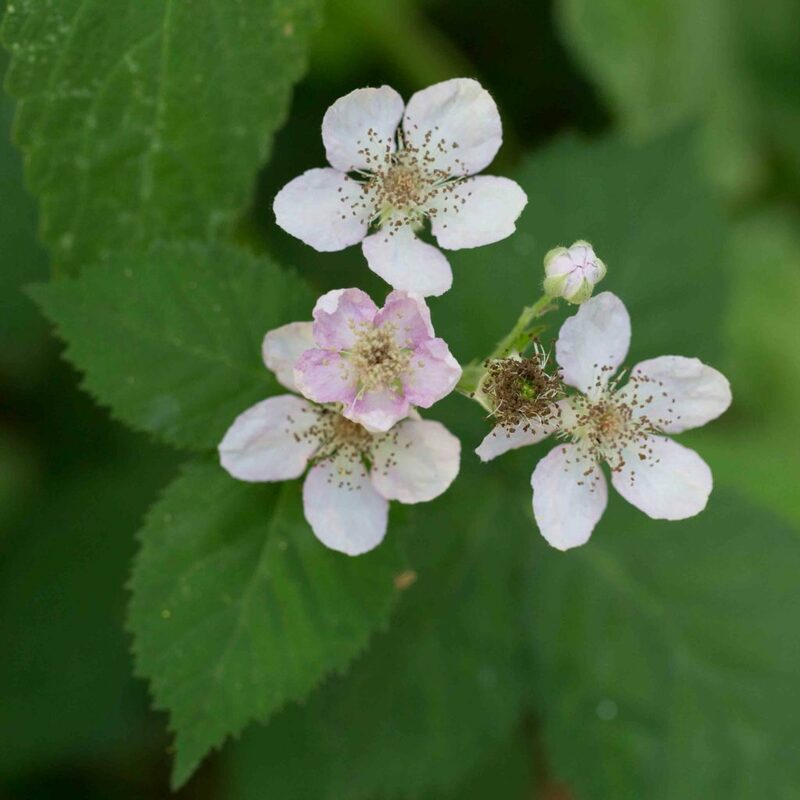 The leaves are divided into 3 thin leaflets. The flowers are pure white or occasionally pink-tinged. 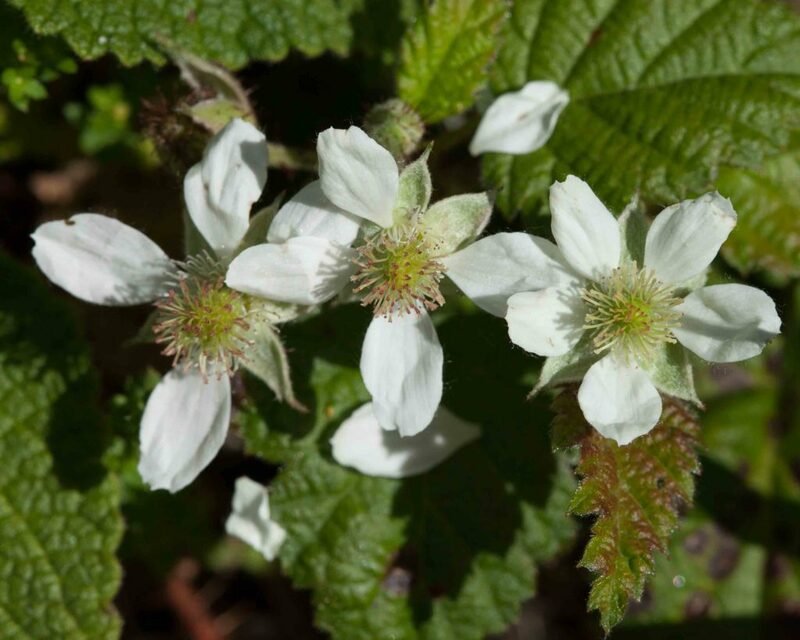 A common shrub with an odd scientific name since “parviflorus” means small-flowered and its flowers are larger than any of the other members of its genus found in California. 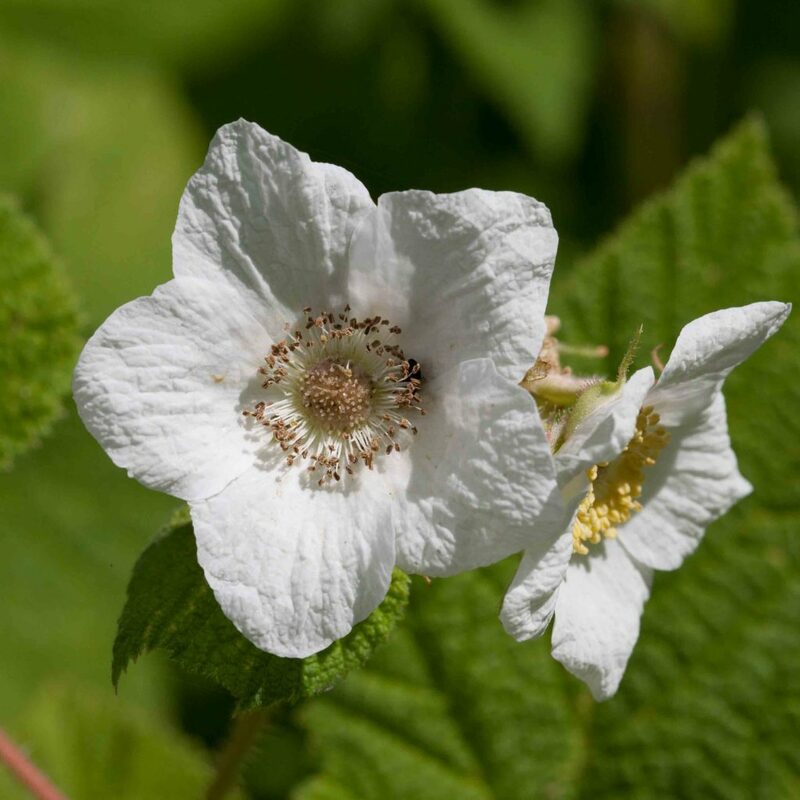 Its large pure white flowers have petals that are 14–22 mm long. 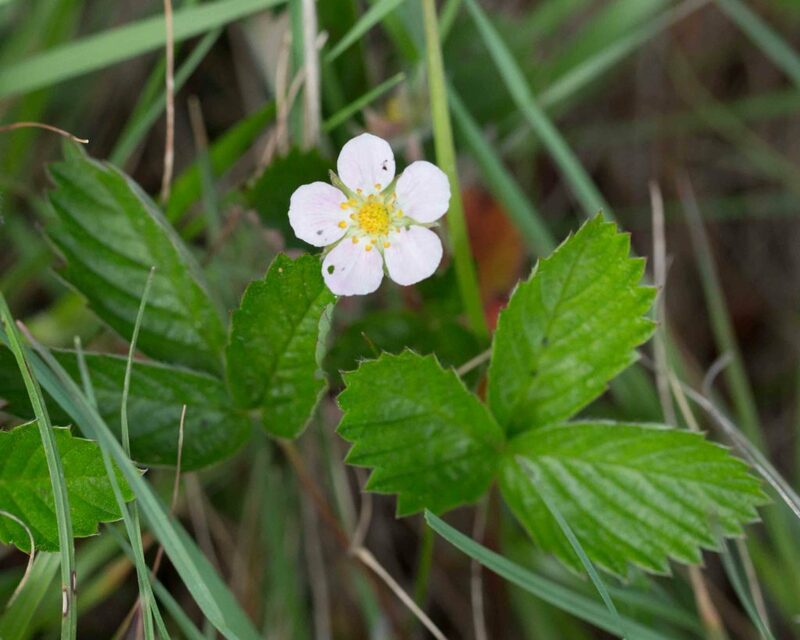 The stems have no prickles. 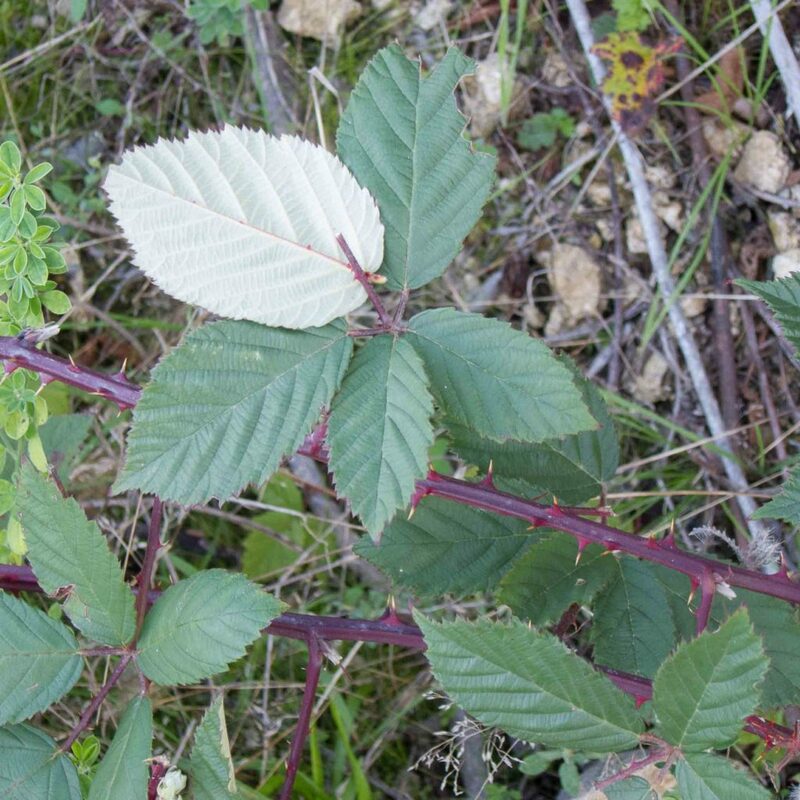 The leaves are large, soft and palmately-lobed. 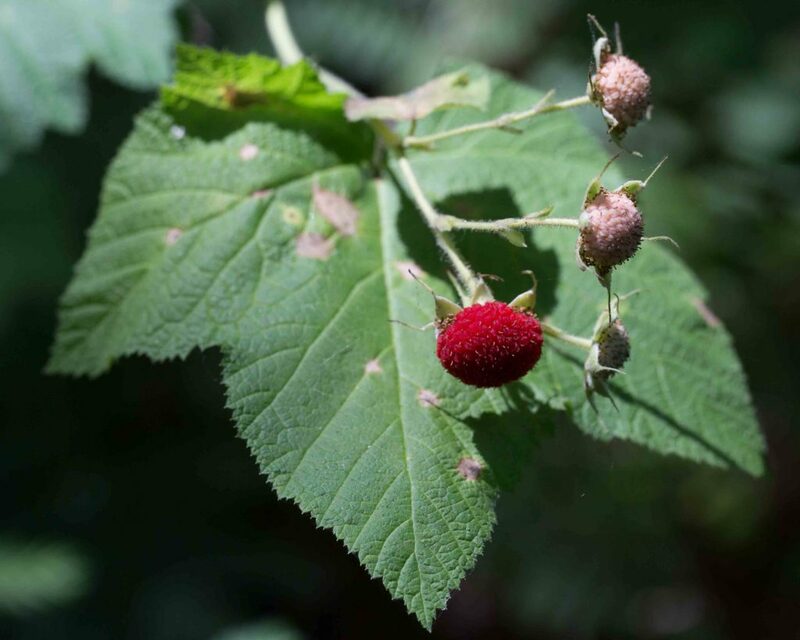 The delicious fruit is like a rather flat raspberry-like. 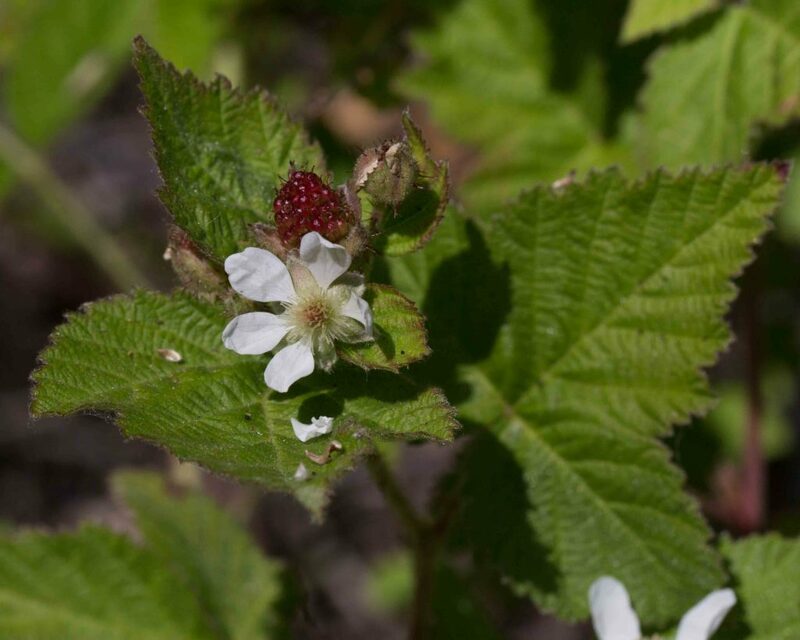 The fruits of this genus are divided into “blackberry-type” which means that the receptacle comes away with the fruit when it is picked and “raspberry-type” which means that the fruit separates easily from the receptacle when picked. The difference is immediately apparent even in store-bought fruit. 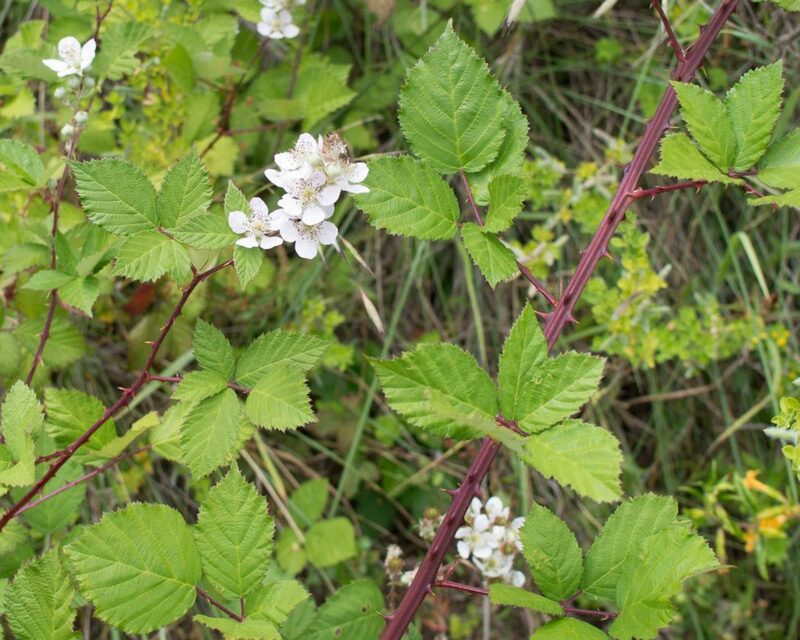 A very common, aggressively rambling shrub with round prickly stems. The plant is generally dioecious, male and female flowers (respectively the left hand and second from left photos) are borne on separate plants. 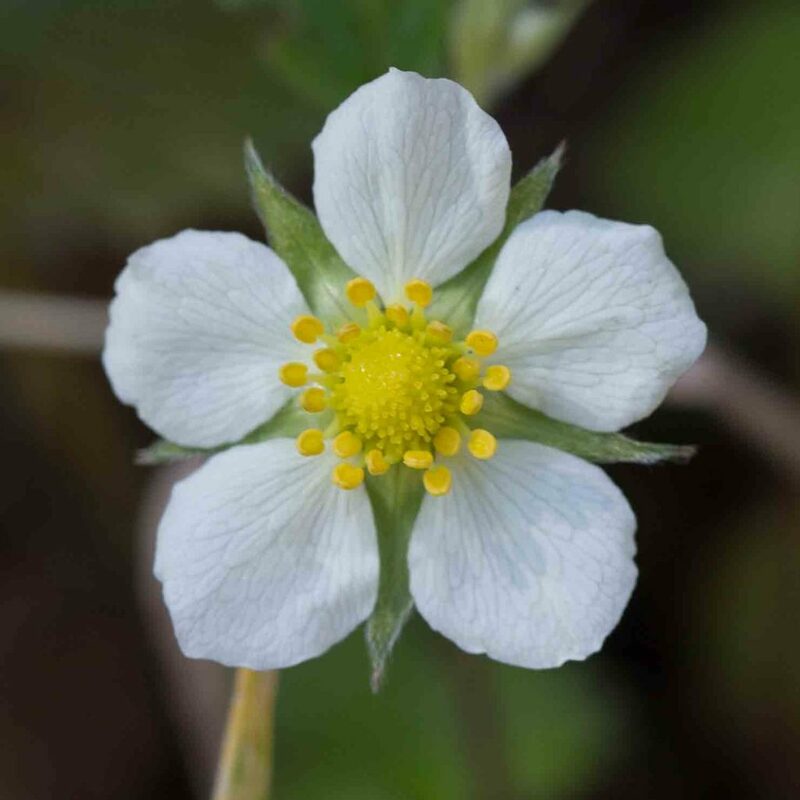 The flowers typically have 5 petals but multiple-petaled forms are occasionally found. 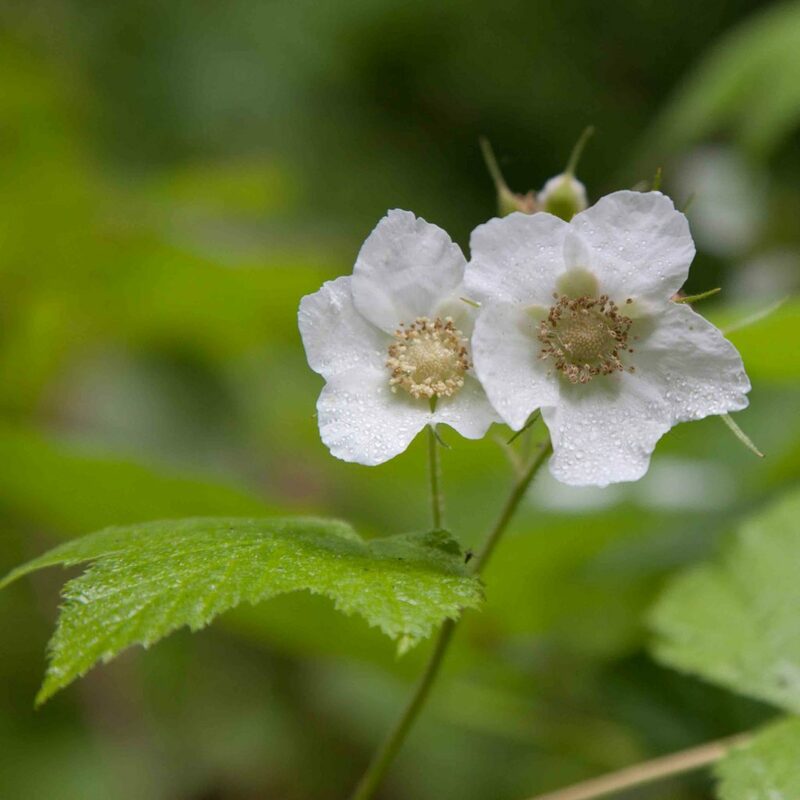 Leaves are simple or compound, in 3s, rough and coarse-toothed. 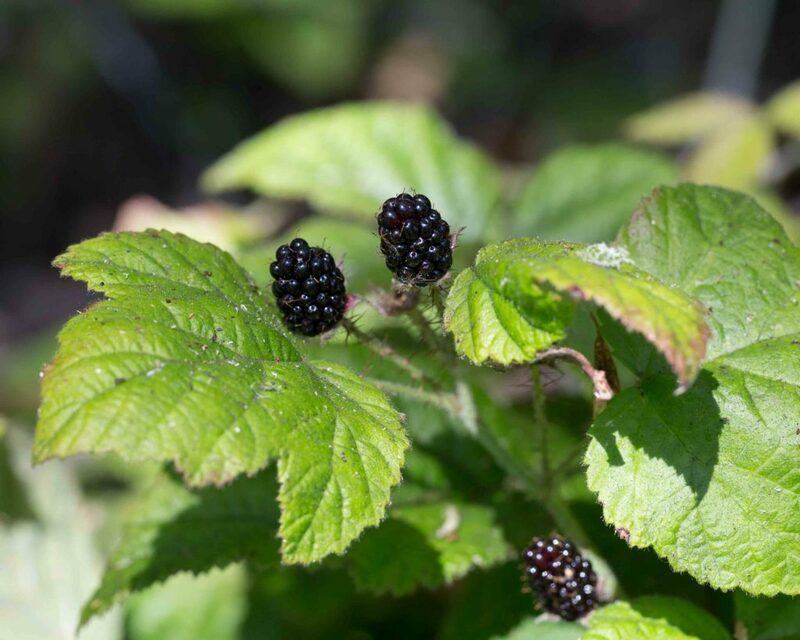 Fruits (from female bushes only — for obvious reasons) are edible. 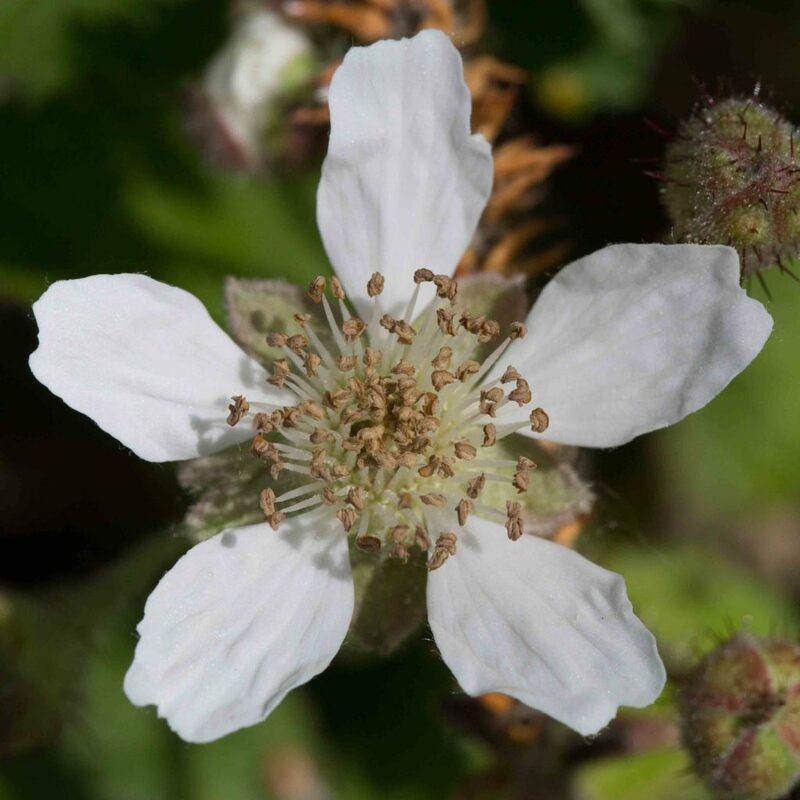 The fruits of this genus are divided into “blackberry-type” which means that the receptacle comes away with the fruit when it is picked and “raspberry-type” which means that the fruit separates easily from the receptacle when picked. The difference is immediately apparent even in store-bought fruit. 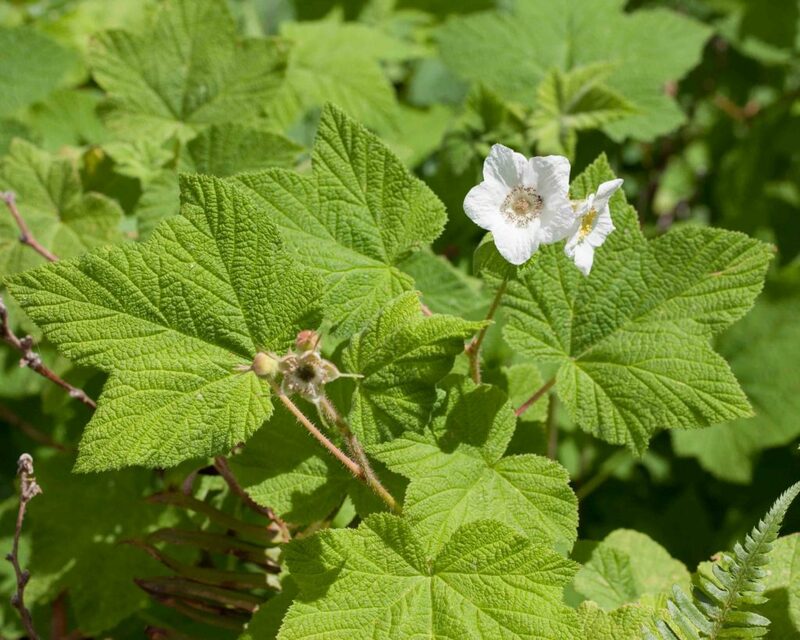 This is similar in appearance and habit to Calilfornia Blackberry (Rubus ursinus) but easily distinguished by its much fatter stems which are pentagonal in cross-section rather than round and by the undersides of the leaves which are white-tomentose. The stem shape is clearly visible, especially on larger stems. 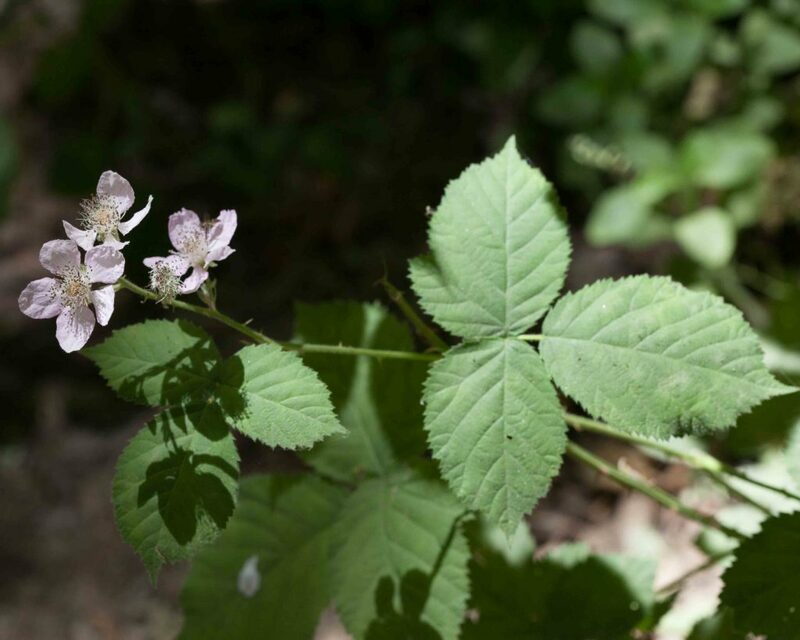 Leaves are also slightly different in shape, more obovate than spade-shaped. 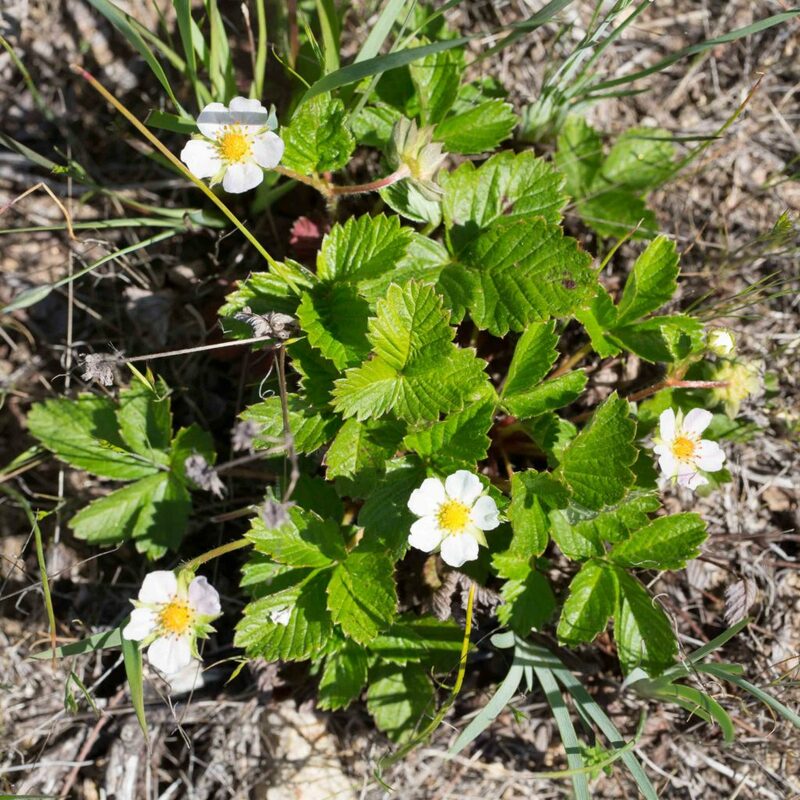 Prickles are stout, straight or curved with a broad base.